Seabuckthorn Pulp is rich in antioxidants like superoxide dimutase enzyme, vitamin c, e, carotenoids and flavoniods. (yang and kallio 2002) that is required for a healthy and beautiful body. Studies have proven that the vitamin c content of seabuckthorn is 4 – 100 fold higher than many other fruits or vegetables (lu rongsen 2003). Seabuckthorn fruit and leaves are a rich source of flavonoids. Flavonoids have been found to possess very strong antioxidant activity. It has been found that flavonoids improve the immunity of the body, lower the osmosis of the capillary wall and prevent oxidation of Vitamin C, control arterioscelerosis, reducing cholesterol level, turning hyperthyroidism into euthyroidism and eliminating inflammation. It is also been found effective against tumour and radiation damage. (In Mingyu et al 1998). Further, Carotenoids are a major source of Vitamin A. Carotenoids particularly B-Carotene and Cantaxathine act as anti-carcinogen and anti-swelling, therefore safeguard from some kinds of skin cancers. Seabuckthorn is therefore especially good for maintaining healthy skin. (Kertangi etal 1984). A number of studies have been carried out on the effects of flavonoids of Seabuckthorn on cardiovascular diseases, and reveal that they have a positive inotropic effect, improve cardiac performance, decrease peripheral resistance and do not increase heart rate. Total flavonoids of Seabuckthorn have a curative effect on angina pectoris and also anti arrhythmic effect. Seabuckthorn extract has considerable anti myocardial ischemiac, anti hyperlipemia and anti-fat liver effects. 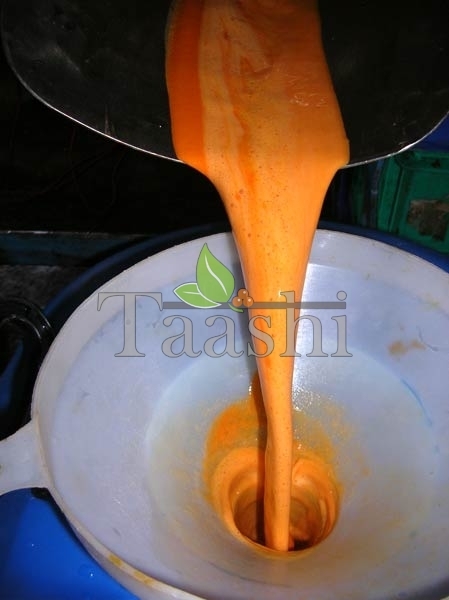 We provide Seabuckthorn Pulp in 50 kg containers. Seabuckthorn provides more than 190 nutrients and bioactive substances, and many of them are considered immune building factors, such as linolenic acid (Omega 3), linoleic acid (Omega 6), oleic acid (Omega 9), palmitoleic acid(Omega 7), vitamins E, A, carotene, polyphenols, flavonoids and trace elements including iron, copper, manganese, selenium, etc. This group of well-coordinated and well-proportioned immune building factors regulates and improves the immune system in different processes and at different levels, restores disturbed immune system, strengthens the body’s resistance to diseases, thus effectively preventing diseases and speeding up recovery. The same qualities are key inputs for good looking skin, hair and nails. Since the later 1970s, scientific studies led to many important discoveries about the adverse effects of free radicals and oxidation on our health. It is found that more than 80 diseases are related to free radicals, the most common ones include stroke, myocardial infarction, infant anemia, diabetes, arteriosclerosis, tumors, cataract, radiation damage, burn, brown spots, wrinkles, aging, arthritis, lung disease, nephritis, hepatitis, etc. Polyphenolic compounds of Seabuckthorn : Polyphenolic compounds of Seabuckthorn possess an anti-oxidant activity. They inhibit the growth of tumors and exhibit a radioprotective action. Neutralizes free radicals : Free radicals have also been implicated in the development of neurodegenerative disorders such as Parkinson’s disease and Alzheimers’s disease. Seabuckthorn fruit and leaves are quite rich in flavonoids which neutralize these free radicals. Carotenoids : Like Vitamin E, Carotenoids belong to the group of lipophilic antioxidants present in Lipoproteins. Carotenoids are well known for their wide distribution in the plant kingdom. Out of 600 Carotenoids known in nature 39 have been identified in seabuckthorn. Wound Healing : Carotenoids improve the metabolic normalization and regenerate the injured tissues. Deficiency of Carotenoids in human foods leads to poor growth, weak eyesight, decreases intolerance to diseases and affects the mucus membrane of gastrointestinal tract. Carotenoids are effective remedies against burn, frostbites, ulcers and various gynaecological problems. (Mashkovski 1997). Stress : Carotenoids raise physical and physiological capacity to work in stress conditions. (Bogdanov et al 1986). Anti-Viral Activities : Seabuckthorn leaves have been found to have high content of polyphenols including tannins. A chemotherapeutic study of dry purified tannin fraction and individual components has revealed a high activity in respect to a wide spectrum of viruses : Influenza viruses/A (H1N1, H2N2,H13N6, H3N2) and B/Singapore/222/79, Herpes Simplex Viruses(HSV), Strain L2, Paramyxovirus infections, adenoviruses type 2, cytomegalo viruses and other viruses pathogenic for human beings and animals. (Shipulina 1999). Seabuckthorn and Immunity : Immunity is the ability and process of resistance of the human body against pathogens harmful to our skin and body. This is crucial to good health because it means not only freedom from diseases and pains, but also a optimal condition physically, mentally and socially. Continuous good health depends on two things: prevention and wholistic maintenance. In other words, Seabuckthorn eliminates pathogens before illness strikes and avoid further pathological changes and complications.